through a special little friend. What a complex world we live in! And, as we all know, it grows increasingly more complex with each day. In some ways this is good, in others perplexing. Surely it must be especially perplexing for the young, who must make sense of it all, with ever increasing agility. Will they be able to increase in this agility with each generation, and keep pace with our world? One wonders. But one must also have hope, and try to provide support and tools which may be of help to them. What once, in the "Ozzie and Harriet" world of the 1950's was simple (though one wonders if the world was ever really as it was presented in the media of that time!) is now much broader, much less clearly delineated, and contains much more middle gray. Perhaps this increasing complexity is just the nature of life, and in some cosmic way, our messy daily lives are simply giving us this message more and more clearly. Or maybe the messiness is an outer manifestation of our inner struggles. No matter, it is no doubt difficult for the young to deal with and understand this cosmic and temporal messiness, as it has always been. Divorce is an issue which is a perfect example of this cosmic and temporal messiness. It is a tough one for adults as well as children to deal with. It is the purpose of this book, to help the young (and old folks, too, who might be reading or reading to their young) to make some sense of this often painful process. 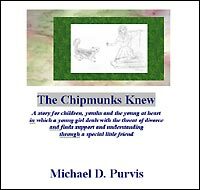 This story endeavors as well, to help young and old alike hang on to some of the hope, optimism, innocence and sense of magic and mystery which is deep inside of all of us. Ideally, we all can hang onto these as we age. Hope, trust, magic, love- we need these in abundance! No matter our age in years, we need these qualities in us and in all of our relationships. It is my prayer that this little story will help you, and help readers of all ages to pull these qualities up from the deep well that is inside each of us. May you utilize and depend on these qualities as the great mitigators, healers, and joy-bringers that they are. They are all of these indeed, even in the midst of growing pains of all sorts, troubled times, and difficulties in our relationships. Penny was a delightful young lady. She was nine years old and was just beginning the fourth grade at her school, which was down the street from the neighborhood in which she lived. It was a wonderful little school in a small wooded area. Now that she was a fourth grader, she was beginning to really feel at home at her school. She had a wonderful teacher, Miss Lansley, who had promised to read all sorts of books to the children. She was currently reading "Wind in the Willows," to them, which Penny loved, especially the parts about a certain Mr. Toad and all his mishaps with motorcars! Soon, Miss Lansley promised, the class would hear "Stuart Little," "The Jungle Book" and many other books. Penny could not wait! Penny loved hearing the imaginative stories Miss Lansley read, but there were many other things she loved about the daily time spent in her classroom. It was a truly fascinating place thanks to her kind and fun teacher. There was so much to see and do! There were wonderful, colorful bulletin boards, areas for creating, spaces for discovering, and places to play all throughout the classroom. There was never a dull moment. Penny loved her teacher and her school. She loved the neighborhood too in which her school and her home resided. And, she had many friends. In fact, it was just the sort of place for children to grow up in. Penny and her friends enjoyed its tree lined streets and its big, sunny, grassy yards, filled with places for hide and seek, and what seemed to them like vast expanses designed especially for tag and games of softball. When they felt like feeling the breeze in their hair, Penny and her friends would peddle all about the sidewalks of this delightful, suburban neighborhood laughing and smiling with delight, soaking up all the sunlight they could. And in the evenings, they would play together and catch fireflies. It was a magical place, though they did not particularly think of it as so. It would only appear to them as such in retrospect, when they were older, and viewed it through the veil of time. To them, as children, it was simply home. Soon, Penny knew, it would be autumn and Halloween would come. They would all dress up on that night and go trick or treating. She could see it in her mind's eye, even now. The evening air would be crisp and cool and wind-swept. The sky would be black as coal, with shining stars, and dried leaves would blow about, making that particular, crackly sound that only dead, brown, autumn leaves make when they dance in the wind. It would be a night of intrigue and mystery. Oh how she loved it! But, of course, Halloween would not be the only joy to come, Penny knew. As the weeks came and went, there would be birthday parties, events at school, and then Christmas would come! Indeed, she was looking forward to these things. "I have a wonderful life with my family and my friends," Penny thought with a smile, which seemed to come from someplace way down deep inside her. Inside her? "And just where exactly, from way deep inside, did this smile begin?" The more inquisitive sorts of you might ask. Well, though it was difficult to pinpoint exactly, it began somewhere deep inside her tummy and from there spread out in waves to her entire body! And, this smile, in fact, was more than just an ordinary smile, for it seemed to be leading Penny, always a unique and perceptive girl, toward a rather special feeling and conclusion, as she sat on the porch of her families' cozy, brick ranch house this late summer day. It was not that this day was so different from others, really, for she had sat on the porch and looked about her with interest many times. The sights were familiar. She saw, for example, just as on any other day, the texture of her home's red, rough bricks. They were there as usual, looking just the same, making her want to reach out and stroke their pocked surface, as they always did. The green shutters were there too, an almost perfect match to the lush, emerald lawn which her father so carefully cut each Saturday morning. She closed her eyes and could see him pushing the mower in his none-too-fashionable shorts, which Penny teasingly called "Nerd-Dad" shorts. She could see him, too, in his white tennis shoes and the black socks which dads were evidently prone to wearing with such shoes. (Well at least her dad was!) She watched her father pass by in her imagination and loved him, nerdy shorts and all. She could almost, even now, smell that peculiar, delicious scent which came from the fresh cut grass and yellow dandelions. She could see and smell all this and more; and it was then that she realized what the smile that came from inside her tummy was trying to tell her. And what exactly was this funny, out-spreading tummy-smile trying to say? "You cannot imagine any of these things which you love ever changing. You will love them forever!" And Penny had to admit it was true. She did not want any of this to change: not the red bricks or the green shutters, not the large, old trees lining the streets of her neighborhood, not the whooshing sound these green, summer leaves made in the breeze as she and her friends rode by on their bicycles, not Miss Lansley and the adventurous world of the books she read aloud, not the smell of fresh cut summer grass and dandelions, not even her father's silly, tall, black socks and white tennis shoes, which made the other children giggle! "Sit up! Look about you! Take notice, girl!" She did. And, she was glad!